Multiple blue and green flashes. 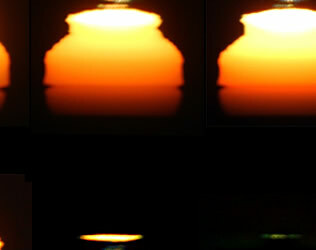 Lyudmila Zinkova (site) imaged this sunset sequence at San Francisco. The camera was ~12m above the ocean level and has caught a complex M-Mir, mock mirage, type sunset with the sun distorted into fantastical shapes and giving multiple flashes. Conditions in coastal California are often ideal for M-Mir flashes. Offshore, the cold California Ocean Current cools the air next to the sea surface. Sometimes above that, warm dry air driven by high pressure over Utah and Nevada creates strong temperature inversions which then produce miraged sunsets and flashes. During Mila's sunset the atmospheric temperature profile was complex and several inversion layers are clearly visible. As the sun descended, simultaneous multiple flashes occurred followed by an intense single blue flash and then several more green flashes. Images ©2005 Lyudmila Zinkova, reproduced with permission.